Dorothy's Really Not in Kansas Anymore . 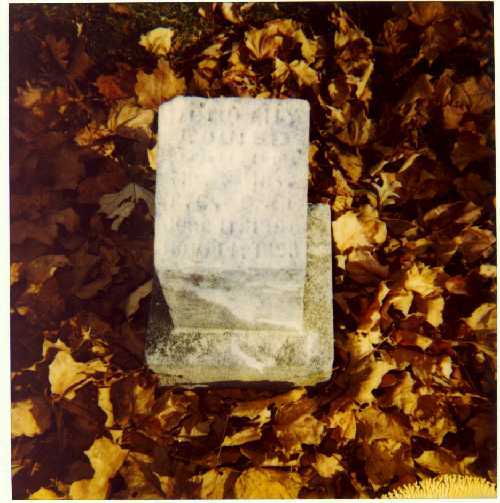 . .
Dorothy's Orginal Headstone & Original Records from Evergreen Cemetery On June 11, 1898, in Bloomington, Illinois, a daughter, Dorothy Louise Gage, was born to Sophie Jewel and Thomas Clarkson Gage, the brother of Maud (Gage) Baum. Maud and L. Frank Baum had four sons, and Maud had always longed for a little girl. On November 11, 1898 (five months later to the day), little Dorothy died. 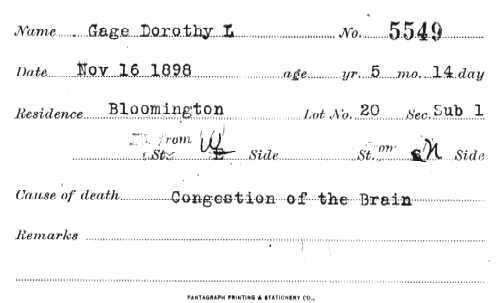 The records at Evergreen Memorial Cemetery state that the cause of death was "congestion of the brain." The Baums were living in nearby Chicago at the time, and Maud attended the funeral. She was overcome with grief, and upon returning home, she required medical attention. 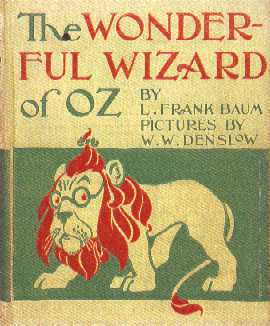 The Wonderful Wizard of Oz L. Frank Baum was just putting the finishing touches on the story his wife had been urging him to put to paper for a long time. The story, as legend has it, evolved as Baum wove it for his children and their friends. It was a fairytale about a magical land and a little girl who wanted to go home. Seeing his wife so distraught after the recent funeral, and not knowing how to comfort her, he named the heroine after little Dorothy, forever immortalizing the child, and dedicated The Wonderful Wizard of Oz to Maud. 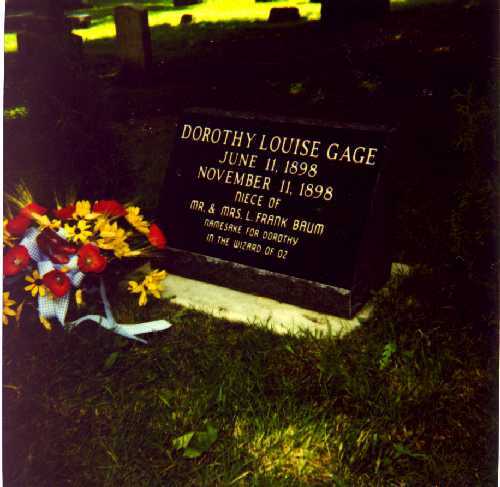 There are many conceivable reasons why Baum gave Dorothy the surname "Gale" — Gale is certainly easier to pronounce and understand than Gage, and is not necessarily a surname. Perhaps the L in Gale, was taken from little Dorothy's middle name Louise. One thing is certain, most people born in the twenty-first century are as familiar with Dorothy Gale as they are with Santa Claus. However it is interesting to note that the surname Gale was not mentioned until Baum's second book. No doubt since The Wonderful Wizard of Oz was nearly completed by the time Dorothy Gage died. What name the little girl from Kansas may have been given had Dorothy Gage lived on remains a mystery. For nearly one hundred years, a story was handed down through generations of Baums about a niece named Dorothy who died and was immortalized in L. Frank Baum's book. 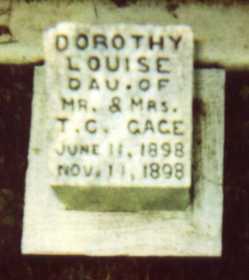 However, it wasn't until the fall of 1996, when Dr. Sally Roesch Wagner, doing research on Maud's mother, Matilda Joslyn Gage (a suffragist who worked closely with Susan B. Anthony), located the grave. Dorothy's New Headstone Dr. Wagner's discovery made the newspapers, and the article was brought to my attention. The article told of how illegible the marker was and of the difficulty Dr. Wagner had finding it. When I read that, I decided I would present the idea of purchasing a new marker for little Dorothy to the subscribers of my newsletter. I called Munchkin Mickey Carroll, a dear friend here in St. Louis who had been in the monument business all of his adult life. Not knowing the current price range for monuments, I thought he could give me a pretty good idea. As I began to explain the story of little Dorothy's illegible marker, Mickey insisted I leave this to him; he was determined to replace the marker on his own--he wouldn't have it any other way. The next day Mickey had a buddy drive him to Bloomington to visit Dorothy's grave. Shortly thereafter Mickey ordered the lovely new memorial for Baum's neice. 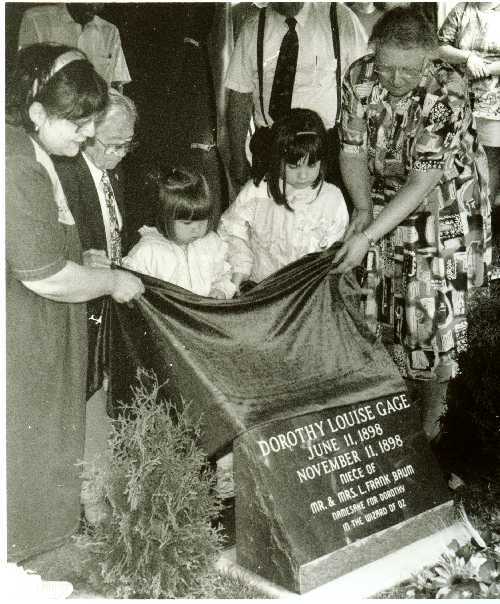 Evergreen decided to name their new children's section the Dorothy L. Gage Memorial Garden. They thought it would be comforting for families who lose little ones to think of them being with Dorothy from The Wizard of Oz. The Unveiling On May 31, 1997, a ceremony was held at Evergreen to unveil the new marker Mickey had made especially for Dorothy. It was also the official dedication of the Dorothy L. Gage Memorial Garden. This picture was taken as the new stone was unveiled for the first time. From left to right are myself, Mickey Carroll, two granddaughters of Virgie Converse, and Virgie Converse herself, then the manager of the cemetery. It was a perfect day, and hundreds of people turned out for the historic moment. The Restored Stone Expert craftsman Charles Tharp, Jr. did an expert job restoring the original marker. It is currently on view opposite the new marker at Evergreen Memorial cemetery. Beyond the Rainbow has made arrangements with a local Bloomington florist to place fresh flowers at the gravesite on the anniversary of Dorothy's birth and death. We also have a holiday bouquet placed there at Christmas time. Anyone wishing to contribute may do so by sending a check to Beyond the Rainbow (marked for Dorothy's Flower Fund). We'd like to thank Katie Fleming who is always a major contributor to the flower fund, plus the many other Oz fans who have contributed to Dorothy's Flower Fund since '97. Tax-deductible contributions can be made to Evergreen Memorial Cemetery for the Dorothy L. Gage Memorial Garden. Evergreen Memorial would like to thank the following contributors to the Garden for their generosity: Mickey Carroll; Robert, Clare, Christine, and Carolyn Baum; Dr. Sally Roesch Wagner; Tina, Andy, Amy, Peter, Reyna and Rileigh Cassimatis; Linda Rosen; Katie Fleming; Jan Vanderwall; Steve Cox; Tod Machin; Eric Shanhower; Elaine and Jimmi Willingham. Contributions for Dorothy's Flower Fund can be sent to Beyond the Rainbow, 956 Briar Green Court, St. Louis, MO 63122-5149. Your generosity is appreciated. Contributions for the Dorothy L. Gage Memorial Garden should be made out and mailed to Evergreen Memorial Cemetery, Dept. BTR, 301 East Miller Street, Bloomington, IL 61701. You will receive a receipt for your tax-deductible contribution.